Waaaaay back in June we met with some prospective clients for an initial consultation down in Palmetto Bay. They had just moved from a smaller home to a new, larger one - bringing their old, small-scale furniture with them. They were a family of four and knew that the space wasn’t quite right with their existing furniture - not enough seating, a lack of cohesiveness and a cavernous echo to boot. They really wanted their new house to feel like home, so they enlisted us to see what we could do to reimagine the social spaces in their home. As soon as we saw the super-high ceilings and huge windows letting all the gorgeous light in, we knew we had a space with amazing potential. Anyway, to make a long story short, we knew we had some great clients on our hands! We LOVED them, they decided that we weren’t (too) crazy, and we hit the ground running on #projectbrightandbreezy. Did we mention that we had a hard deadline of November 23rd for complete installation? Our clients had a big Thanksgiving party in the books, and wanted everything ready in time for the big reveal! Like we said, the spaces had SO much potential - a great layout, high ceilings, neutral walls, and plenty of natural light! Let’s start with the entryway! The entryway got an update with some greenery, and a big, beautiful pendant to anchor the space. We went for a geometric pendant with brass accents that feels classic with a modern edge! We took advantage of the wall space in the entryway with an oversized round mirror for maximum impact (and maximum eye candy), and paired it with a custom bench by Grove and Anchor. We’ve gotta stop here and gush a little about Rob over at Grove and Anchor. We commissioned a few custom pieces from him for this project, and seriously, they all turned out STUNNING. He didn’t even bat an eye when we asked him to dream up a magical dining table that seats 8, and then 10, and then 12, and is extra wide, and made of reclaimed wood, and starts the coffee pot before you get out of bed in the morning. It’s great and we love it - and our clients loooooove it!. Check him out peeps, you will not be disappointed (www.groveandanchor.com). The entryway flows right into the open concept lounge and dining spaces.The clients dreamed of a more sophisticated lounge space that would be perfect for conversations and cocktails, with plenty of seating for friends to gather. We started from scratch with all the furniture selection with the exception of the pair of bookcases in the lounge. The were inherited from Mexico and the clients wanted us to try our best to work them into the new design. With a little re-finishing and some brand new hardware the bookcases fit right in - look at that match with the teak chair frame! Some of our favorite things in these spaces are the personal touches in the artwork - the lounge features an oversized vintage map of our clients' native Boston framed in petite black and gold frames. In the living room, we had the pros at Framebridge frame up some black and white photos of the family's favorite national parks with asymmetrical mats to create a streamlined gallery wall. Since this was the designated “grown-up” area in the house, we went with white upholstery and textiles in a muted palette. We can’t get enough of the gorgeous vintage rug and the way it ties together all the colors in the space! We were lucky enough to partner with Miami Flower Market to create a gorgeous living centerpiece for the coffee table. They had an amazing selection of succulents and mosses to fill our dish, helped us pick out the best combinations, and gave us helpful tips for proper succulent care (which we desperately, desperately need). The dining room was key for this re-design, as our clients were planning to host a big Thanksgiving party full of friends and family and they would all need somewhere to sit while chowing down on their turkey and pumpkin pie. Since they’re usually a party of 4 and wanted a table to seat 12, we decided that an extendable table with leaves would be the best option to comfortably seat the family and, when needed, extra guests. Check out the beauty of a table that Grove and Anchor crafted for us - 11 feet of reclaimed wood, farmhouse-style goodness with 2 removable leaves on either end. We felt strongly that the lighting in the space should complement the table at each size, and this abstract pendant does exactly that! We love the warmth of the brass, and the way it contrasts with the blue abstract pieces we selected for the walls. 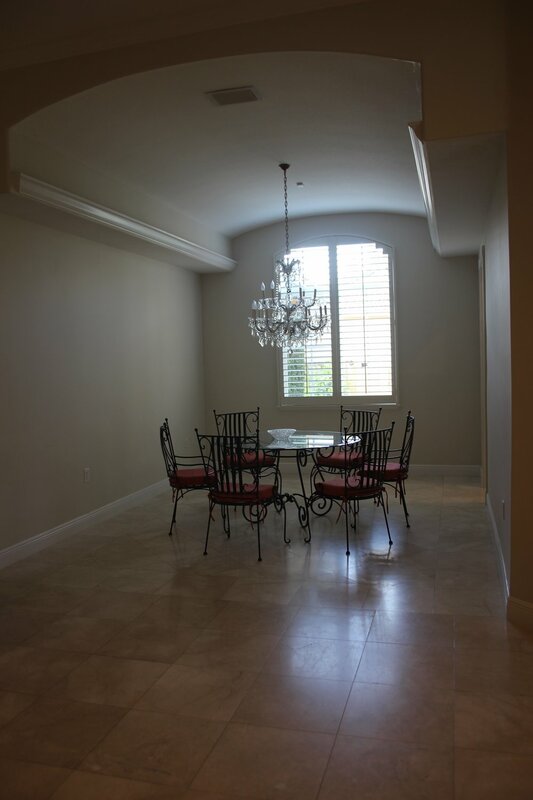 When we first toured the house, the breakfast nook was just a glimmer in our clients eyes. And by a glimmer in their eyes, we mean an awkward, angular space between the open plan kitchen and living room. This space was begging for some built in benches, so we had a piece built to match their existing media center, and topped it with some gorgeous custom upholstery in a Nate Berkus for Fabricut striped fabric. We topped it with pillows gorgeous blues and greys to make it comfortable and cohesive. Our clients let us know early on that the living room space was where they spent a good portion of their time together as a family - a big sectional with plenty of room to stretch out and lounge was at the top of their list! They definitely had the space for tons of seating, but needed a little reconfiguring to make the most of their space. And, needless to say, we couldn’t wait to get our hands on that media center. Shelfie anyone? Before we show you how amazing this living room looks now, we need to tell all of you how much of a miracle it is that the custom sectional turned up in time for install. Between production issues, a delayed delivery date of more than a month, and a lost-on-the-delivery-truck situation, this here beautiful sofa has taken years off our lives. BUT, we managed to wave our magic wands (do a LOT of talking on the phone to anyone and everyone who would listen to our sad sofa story) and HERE IT IS in all of its sofa glory, on install day, as promised. We tied in the blue from the breakfast nook here and added a pop of lilac, making for a light, bright, family friendly space! With added armchairs, a pair of accent stools, and window seat benches - upholstered in a crisp white - there’s enough space for the whole family on movie nights. The idea for this space was ultimately comfort first, so we decided to forgo a traditional coffee table in favor of a custom upholstered ottoman in a gorgeous batik linen. The custom ottoman tray by Grove and Anchor is the perfect spot for snacks and drinks, plus it leaves enough room to prop your feet up while you lounge. We’re now pretty convinced that this might just be the perfect ottoman situation. And there you have it, #projectbrightandbreezy everyone! Tell us what you think below!